Alternately, import scripts can load data directly into the database, which is a highly flexible but much more complex method of loading materials suitable for large batches of records such as the initial migration from your legacy library system. The staff client has a utility for importing batches of bibliographic and copy records available through Cataloging > MARC Batch Import/Export. In addition to importing new records, this interface can be used to match incoming records to existing records in the database, add or overlay MARC fields in the existing record, and add copies to those records. The MARC Batch Import interface may also be colloquially referred to as "Vandelay" in the Evergreen community, referring to this interface’s internals in the system.You will also see this name used in several places in the editor. For instance, when you click on the Record Match Sets, the title on the screen will be Vandelay Match Sets. When importing in batches of up to 500 to 1,000 records. When you need the system to match those incoming records to existing records and overlay or add fields to the existing record. When you need to add copies to existing records in the system. If you are importing copies that do not have barcodes or call numbers, you must enable the Vandelay Generate Default Barcodes and Vandelay Default Barcode Prefix (vandelay.item.barcode.prefix) settings. Click the Record Match Sets button to identify how Evergreen should match incoming records to existing records in the system. These record match sets can be used when importing records through the MARC Batch Importer or when importing order records through the Acquisitions Load MARC Order Records interface. On the Record Match Sets screen, click New Match Set to create a set of record match points. Give the set a Name. Assign the Owning Library from the dropdown list. The Match Set Type should remain as biblio. Click Save. If you don’t see your new set in the list, in the upper left corner of the staff client window, click the Reload button. If you had to reload, click the Record Match Sets button to get back to that screen. Find your new set in the list and click its name. (The name will appear to be a hyperlink.) This will bring you to the Vandelay Match Set Editor. Create an expression that will define the match points for the incoming record. You can choose from two areas to create a match: Record Attribute (MARC fixed fields) or MARC Tag and Subfield. You can use the Boolean operators AND and OR to combine these elements to create a match set. When adding a Record Attribute or MARC tag/subfield, you also can enter a Match Score. The Match Score indicates the relative importance of that match point as Evergreen evaluates an incoming record against an existing record. You can enter any integer into this field. The number that you enter is only important as it relates to other match points. Recommended practice is that you create a match score of one (1) for the least important match point and assign increasing match points to the power of 2 to working points in increasing importance. . After creating a match point, drag the completed match point under the folder with the appropriately-named Boolean folder under the Expression tree. Quality metrics provide a mechanism for Evergreen to measure the quality of records and to make importing decisions based on quality. Metrics are configured in the match set editor. Quality metrics are not required when creating a match set. You can use a value in a record attribute (MARC fixed fields) or a MARC tag as your quality metric. 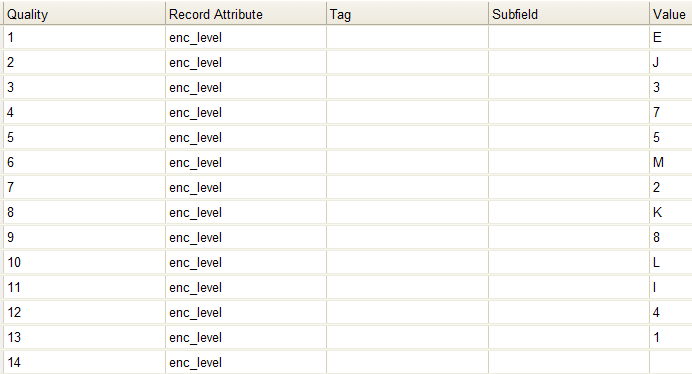 The encoding level record attribute can be one indicator of record quality. 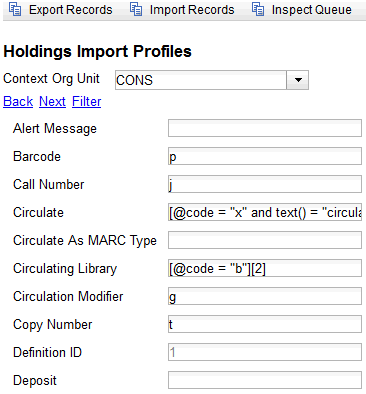 These overlay/merge profiles can be used when importing records through the MARC Batch Importer or when importing order records through the Acquisitions Load MARC Order Records interface. Default merge - No fields from incoming record are added to match. This profile is useful for item loads or for order record uploads. Default overlay - Incoming record will replace existing record. You can add multiple tags to these specifications, separating each tag with a comma. After making the above configurations, you are now ready to import your records. You do not need to select any of these import options at this step. You may also opt to review the records first in the import queue and then import them. Insufficient Quality Fall-Through Profile can also be used with quality metrics. If an incoming record does not meet the standards of the minimum quality ratio, you can identify a back-up merge profile to be used for those records. For example, you may want to use the default overlay profile for high-quality records but use the default merge profile for lower quality records.